Baby fads are a dime a dozen, but one fad that seems to be catching on is the baby box. Stores, prenatal courses, people all have suggestions for what new moms need to have to take care of their baby and make their lives easier. They also have lots of suggestions for what new parents don’t need. Confusing, right! Filled with these conflicting suggestions, the new-mom-to-be creates a gift registry for her baby. She hopes for the best and that her experiences as a new mother will resemble whoever’s advice she chooses to trust about what to include. There's the basics, the necessary items and the indulgences. Every registry has them. She also hopes she can afford everything she forgets to put on the list, or everything that people don’t buy for her. Things like diapers, a crib, and more than one sheet set so if the baby has an explosive poop in the middle of the night she can change the sheets. These are all necessary and basic items that mom will need for the baby. What if someone else took care of all of those worries for her, and gave her everything she really needs in a nice little package? Enter the Baby Box. This simple yet effective box is filled with the essentials like diapers and clothes, and it doubles as a portable baby bed, so no matter where you are, your child will have somewhere safe to sleep. Here are 15 amazing things you might not have known about baby boxes. The purpose of the baby box is to prevent infant deaths. Since Finland started using baby boxes, the boxes have been doing just that. The country's infant mortality rate dropped so much it is now one of the lowest in the world. It went from being 21.9 deaths per every 1000 babies born in 1960 to 1.9 deaths out of every 1000 babies born in 2015. While some of that also has to do with better medical care for mothers and babies, part of that care is in the baby boxes. And by way of comparison, the infant mortality rate in the United States was as high as 5.6 deaths out of 1000 births in 2015, which is almost three times higher than the rate in Finland. Even though Finland and the US have the same medical advantages, the death rates in the States is still higher. So evidence points to some medical benefits in offering new mothers these baby boxes. One of the most expensive aspects of having a new baby is buying a crib or a bassinet for them to sleep in. So families who aren't able to afford either of those items are left with sleeping options that can increase their baby's risk of SIDS, like bed sharing. But because the baby box doubles as an infant bed it eliminates the need for a crib or bassinet, so babies have a safe place to sleep that meets the American Academy of Pediatrics' guidelines: the mattress is firm, there's no loose bedding, and your child can sleep on her back. It’s also small enough that it will easily fit into your bedroom with you for your child's first six months, which is another recommendation by AAP. These boxes can fit in the bed without being a hazard or dangerous to the baby. It also makes it easier for the mother who decides to breastfeed. While they have a similar name, baby boxes are not the same thing as an angel cradle. Angel cradles, which are also called 'baby boxes,' are safe places where parents can leave unwanted children without any questions asked or without fear of legal recourse for child abandonment. Most notably these boxes only contain children, not baby supplies. For example, Indiana has two angel cradles. 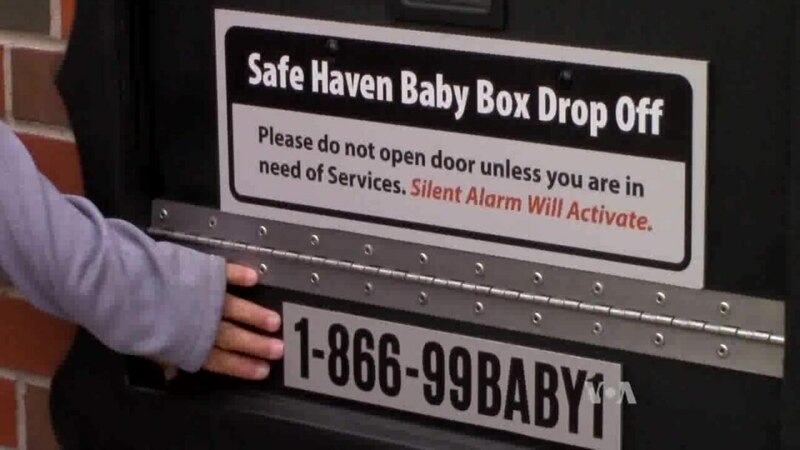 These boxes are equipped with heating and cooling features so that when someone drops off an infant under the Safe Haven Law the child doesn't overheat or freeze before someone finds them, which should be fairly quickly since the boxes also trips an alarm to let someone inside the fire station, police station or hospital know a baby is there. These babies who are left in the Angle boxes are usually given over to the state to be placed up for adoption or placed into foster care. While the benefits of baby boxes aren't unknown, the States is still a little slow on the uptake when it comes to making sure they are available for new mothers. Currently, only three states provide baby boxes to new mothers: Alabama, New Jersey, and Ohio. In Finland you have to get a prenatal checkup within the first four months of pregnancy to receive a box. In the States that offer these boxes, they ask that parents be willing to watch a few educational videos about SIDS and safe sleeping practices, then afterward take an online quiz. While both of these measures are beneficial in conjunction with the box, it would be interesting to know if certain contents within the box are more likely to help babies survive the first year, or if it's the checkups and education that is the most beneficial to mothers and babies. You read that right. Even if you don't live in Alabama, Ohio, or New Jersey you can still get a baby box for yourself or someone you know who's having a baby. Now that is really cool. If you live in a neighboring state and could benefit from this box, it may be worth the drive to get some education on how to help your baby in their first year and while you're there, get some baby supplies and a box for your baby to sleep in. Although, it won't be free this way. Parents looking to take advantage of this program must pay for the box and the contents. However, depending on what you want in it, it'll still cost you less than some bassinets, and you will get so much more than you would with a simple bassinet. While there are many similarities between what a mother from 1938 needed for her baby and what a mother needs today, there are a few differences. And the contents of the boxes have changed to reflect those differences. While the contents in 1938 would have been the bare necessities, modern baby boxes contain everything from samples of baby products to useful items. One of the main changes is that mothers are no longer expected to make baby clothes. Back when baby boxes were first introduced mothers would make the clothes for their babies, so the boxes would simply contain the fabric she would need. Modern baby boxes contain all sorts of cute ready-made clothing for your little one to wear. Sometimes people give these boxes as gifts at baby showers. Mothers who receive them as gifts and know what they are get pretty excited over them. The AAP's infant sleep guidelines are for every time your child sleeps, whether it's at night or for an afternoon nap. The baby box will help you meet those recommendations because you can simply bring your baby's bed with you. So if you are going on a family vacation, you can simply bring the box along, and, as an added bonus, you can even shove all of the baby’s necessities back into the box to transport them from one place to another. The portability of baby boxes is helpful for another reason too. Nap time is not the only time parents need to put their children down. At some point in time, you're going to need to go to the bathroom, grab something from the top shelf, or want your arms to yourself for a moment. The baby box creates a safe place for you to put your child down in those instances too. Baby boxes are essentially baby starter kits for new parents. They're filled with all sorts of things that new mothers need to care for their babies. For instance, they come with onesies, baby socks, mittens, infant hat, washcloths, burp cloths, baby sleepsacks and more. All of this makes sure that all babies get off to a good start in life, and allays some of the mom's worries about having forgotten to get something important before her child arrives. These boxes can even help mothers who may not have money to buy these important starter items on their own. Some places allow parents to pick and choose items they want for their baby boxes. So if you already have some of the items available, you can always choose items you don't have or forgot to get for the baby. The three States that currently give out baby boxes all use the same company to create both the educational videos and the baby boxes. However, in a rather ironic twist of fate, the Baby Box Company isn't in any of those States. One of these baby box companies is located on the other side of the country in San Francisco, California. Parents can order these boxes directly from the BabyBox University site. These boxes are filled with educational videos, books, and more to help parents have a successful first year with their baby. Parents even have access to medical information through contact information provided in the boxes. Parents can visit the website and choose items they wish to have placed in their boxes. These items can include everything from baby clothes to baby accessories. Aside from necessities, baby boxes also include articles and other educational materials to help parents learn how to take care of their baby. For instance, the documents will talk about the different stages infants go through, and how they should be acting when they are two months, four months or eight months old, so parents know what to expect. The materials also help parents learn how to bathe their child, they might also have pamphlets that explain different positions the mother can try if she wants to nurse her baby and so much more. It's possible that different states put different information in their baby boxes, but new parents can always ask what type of educational materials are available to them. And if any new parent feels completely unprepared or scared, ask to have all educational materials put in your baby box. Unlike most boxes that supplies come in, the baby box is not a bland white or brown box. They're covered in different cute prints. So when your child has outgrown the box as a bed you can still use the box for other things without feeling like it's an eyesore. Many parents continue to use the boxes to hold anything from toys to clothes. For example, you could use it to store your son's toys, his scribble masterpieces, or his rock collection. You could even pack it with baby items to save for your next child or make it into a time capsule for him when he's older, and store items like his first lock of hair that was cut, or his first tooth that fell out. Basically whatever you want to use the box for when the baby outgrows it, it'll still look good and be useful. This simple, yet brilliant idea originates from Finland. Years ago government officials noticed that their country had a high infant mortality rate, and they decided to do something about it. So they created baby boxes, which would be given to new mothers to help them out by providing necessary items. Since they started handing out these boxes, the infant mortality rate in Finland has dropped quickly. The boxes contained diapers, baby clothes, changing pads, sheets and toys. Once the box was emptied, the box was used to hold the baby, and even put into bed with mom for easy reach when the baby would wake for midnight feedings. The idea was if the government supplied the basics, babies and their mothers would have a higher chance of successfully making it past the danger point for babies and encourage mothers by supplying them with things they need. This Finish initiative to lower SIDS and increase the life span of babies born during the pre WWII era was rolled out out in 1938. Since then the mortality rate of Finland's babies has dramatically decreased. It seems that by giving new moms a hand in the beginning sets the tone for later success. Whether it was the government giving the mothers a hand during the great depression that helped increase the chances for success, or whether it was a safe space for babies to sleep that helped isn't clear, but this program has been widely successful and has been adopted by other countries since the programs inception. While the United States has been fairly slow towards introducing baby boxes for new mothers (most States don't have them yet), the idea is not new. 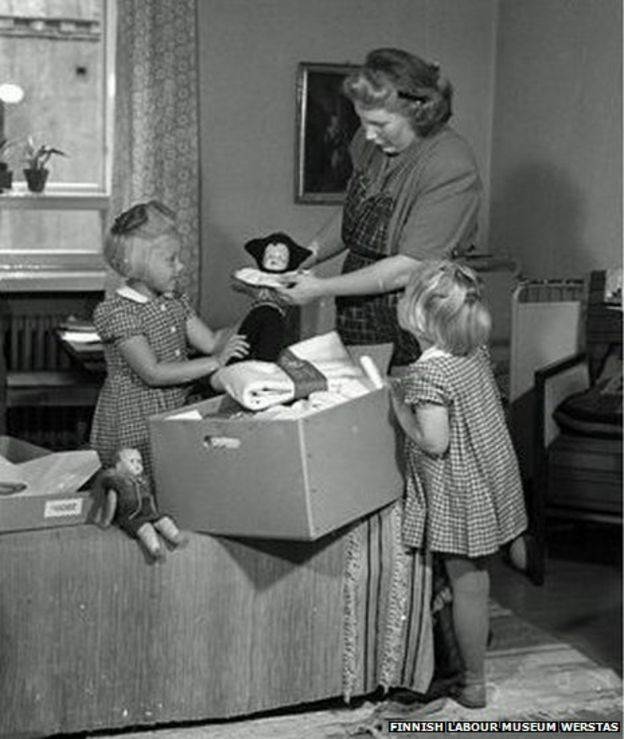 The first year baby boxes were used in Finland was 1938.